Bernie's Dawg Blawg: Ahem...what about Bauta? 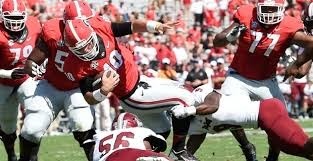 Look, there's three different camps when it comes to Georgia's quarterback situation. Actually, there's probably four when you include that one that thinks Todd Gurley should be under center. And roughly half of them are serious about it. 1. Mason is okay. Just needs his full arsenal of receivers and things will be fine as long as he can hand it off to Todd Gurley 25 times a game. Ok, but I don't think Mason is okay. I was willing to give him time to get okay, but we're five games into the season and just how long were we supposed to wait? From my seat, well outside the arena, it's all in his head. I can still make an argument that there's something physically wrong, but more and more people who see him throw on days that aren't just Saturdays keep saying he's zipping it around the practice field like we got used to at the end of last season. And those people aren't just other players sticking up for him. Regardless of whether it's mental, physical, or both, again...how long are we supposed to wait? 2. Ramsey is the guy. And the time is now. This camp thinks that a) the season is lost somehow and might as well start the future guy now, or b) he's the best option regardless. I'm not willing to throw in the towel on 2014 just yet. I mean, we are 4-1 and control our own destiny. Let's see how Saturday plays out and which team is left in the front seat before we take the whoa is me attitude. However, I would like to see Ramsey press for the starting spot rather than wait for it to fall in his lap. You can see he has the more lively arm. He just has to prove he can manage the game as well as #14. And I think he can prove that he should be the game's starter by being the game's finisher. He led the team on a decisive drive in the first quarter of the Vandy game that ended in a touchdown to put us up 21-0. Do something like that in the fourth with the game on the line and this becomes a whole other argument. 3. What about Faton Bauta? Yes. What about him? This is probably the smallest camp of the three. In fact, it may just be me. But the fact is - this is a run first offense. More than that, this is an offense that wants (and needs) to lean on the run in the fourth quarter. Bobo is intentionally keeping Gurley fresh for the last 15 minutes because he has both the luxury and the necessity to do that. Bauta is made for the zone read game. It would be absolute money in the fourth. Bauta is likely the third quarterback into the game because his coaches trust the other two more. But as long as Ramsey is getting a series to "wet his feet", why not give Bauta a series to pound the damn rock? *Yes, I know it's picking nits when the offense is averaging 45 points a game. But eventually this offense is going to need to be more dynamic. I mean, how many tricks can Gurley hold up his sleeve that is already full of biceps?